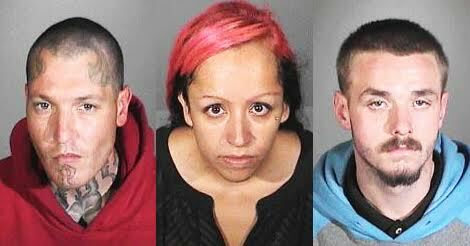 From left to right: Jonathan Robert Myers, Sade Perez/Monica Minijarez, and Ryan Andrew Valencia. Photos courtesy of CSULB Police Department. Three suspected burglars were apprehended by Cal State Long Beach (CSULB) police late last week after they were found in possession of drug paraphernalia and tools usually used in vehicle burglaries, university officials stated. The incident happened on Thursday, April 21 when a University Police Department sergeant was en route to assist officers with a suspicious person investigation at Parking Structure 1, according to a crime bulletin. The sergeant “observed a vehicle traveling at an unsafe speed on a road in which vehicular travel is restricted,” the bulletin stated. He believed the vehicle was related to a report of a suspicious person in Parking Structure 1—where the official was at to assist in the investigation. Patrol officers and detectives stopped and searched the vehicle a short distance away. “Officers uncovered potential identity theft information, controlled substance paraphernalia, and tools consistently used in vehicle burglaries,” officials stated. The occupants of the vehicle were apprehended and later identified as Sade Perez/Monica Minijarez, 31, Jonathan Robert Myers, 31, and Ryan Andrew Valencia, 21. Perez/Minijarez was cited for possession of personal identifying information of another and various vehicle code infractions; Myers was directed to leave campus; Valencia was also directed to leave campus and cited for possession of controlled substance paraphernalia, according to the bulletin. Officials said they believe the individuals were in the parking structure to commit vehicle burglaries or vehicle thefts. At this time there have been no reports of missing or damaged property. Police were initially called to the area after a CSULB student tipped them off about a “suspicious person,” which led to the identification and apprehension of the alleged criminals, officials said. Motorists should also secure their vehicles and never leave valuables plainly visible, the report asserted. The case is being actively investigated by the University Police Department. Detective Sgt. Johnny Leyva at [email protected] or 562.0011, Detective Antonio Maciel at [email protected] or 562.985.0018, or Detective Chrstopher Brown at [email protected] or 562.985.8938. The CSULB Police Department can be reached at 562.985.4101.